Perfect for a romantic moment, with a heart-shaped spoon! One of the first objects of the F.F.F. collection (Family Follows Fiction), exploring the loving structure of shapes and objects. The outcome of this collection is a family of fun and super functional objects, perfect for the whole family. 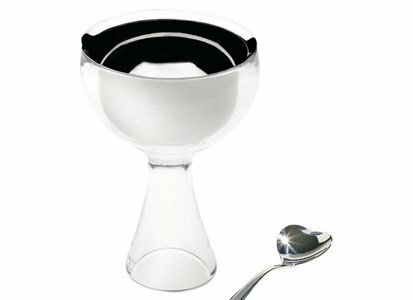 The outer bowl is made of PMMA, and the inner bowl and spoon are made of stainless steel. No ideas to surprise your soulmate? We have suggestions of plans, to make this the most romantic day of the year. On the most romantic day of the year, find the perfect plans for a night for two at home.